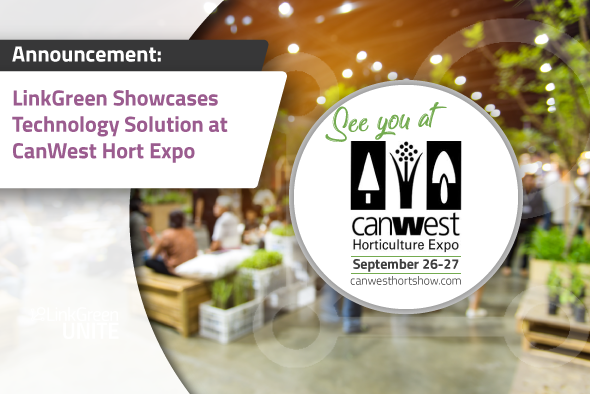 September, 19th 2018, For the fourth year in a row, LinkGreen will be attending CanWest Horticulture Expo, presenting their technology solutions for wholesale online and mobile ordering. LinkGreen, a North American technology company, will be demonstrating new time-saving features they offer to growers, suppliers, distributors, and retailers in their largest booth to date. With a growing customer base turning to their wholesale ordering solutions, LinkGreen is excited to demonstrate the increasing value they offer to businesses that operate in lawn and garden, greenhouse, nursery, and home decor industries.The developments made over the past calendar year include a mobile sales rep app, digital asset management and Shopify integration that extend sales opportunities and bring operational efficiency to new heights. LinkGreen will be showcasing mobile barcode scanning at booth 320 at CanWest Horticulture expo this year, offering attendees a chance to give it a try. Robert Tigwell COO, will be offering appointments to all those interested in exploring LinkGreen’s technology solutions. “We have greatly expanded our technology to better serve wholesale suppliers, distributors, and retailers over the past year. There is no better time to take advantage of all that LinkGreen has to offer,” comments Warren Patterson, CEO of LinkGreen. By exhibiting at CanWest Horticulture Expo, Western Canada’s largest horticulture trade show, LinkGreen will continue to help make wholesale ordering fast and easy for exhibitors and attendees alike. LinkGreen (www.linkgreen.ca) is a technology solution that connects industry supply chains to make wholesale buying and selling fast and easy. The company has created a fully connected and integrated supply chain that provides innovative operational efficiencies, modern sales, and marketing opportunities, and a familiar digital ordering experience for suppliers, distributors, and retailers. Now in its fourth year of operation, LinkGreen serves multiple industries, including Lumber & Building Materials, Greenhouse, Nursery & Floriculture, Lawn & Garden, Cannabis, and Home Decor. With over $765 million in vendor supply available, there are more than 4,200 registered wholesale buyers who now enjoy an electronic supply chain.